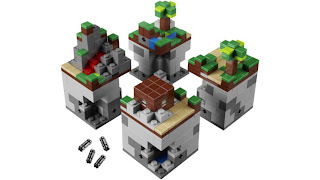 miniBIGS Minifig Blog: LEGO Minecraft! 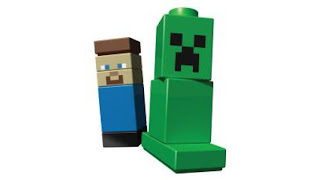 Mojang and the LEGO group have finally shown off the first official pieces of Minecraft LEGO to the world. The set will be released this summer for $34.99 in the US, each set will contain four modular cubes and the surface of each can be removed to reveal mines and resources hidden underneath. Steve and a Creeper will also be included in the set. “I played a lot with Lego bricks as a child, and that’s influenced how I make games. I prefer games with levels that are modifiable. I don’t like static levels. There are problems of scaling. Minecraft has huge long tunnels, and you can’t really fit that in to a living room. 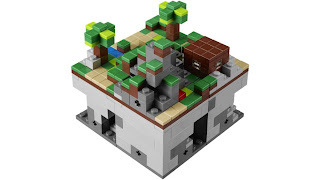 But I think the Lego guys have created something that’s really great, that really feels like Minecraft.